There is an easy way to create Pump Programs! Use the PPL Creator spreadsheet which is installed with SyringePumpPro. PPL Creator is supplied by New Era Pumps. It is easy to use but you still need to be familiar with how the pump works, and the pump commands in order to write programs for your pumps. If your not sure about your particular pump’s brand or model – check out the compatible pump’s page. Credit: This PPL spreadsheet has taken Barry Cowan owner of New Era Pump Systems a lot of time over the years to create and update. 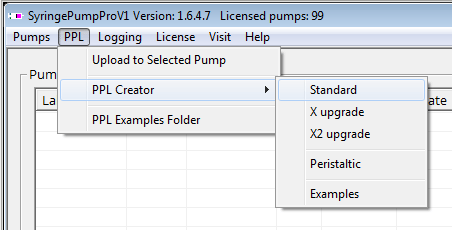 SyringePumpPro installs three versions of the spreadsheets covering the different models of the pumps. Standard NE-1000, NE-1200, NE-1600, NE-1800, NE-500, NE-4000, NE-4500 models – not using X and X2 upgrade features. NE-1002 micro-fluidic pumps use this spreadsheet with Microfluidic units in selected cell O17. Pumps having X and X2 in their part number. Including clear, blue, green heads. In the pump user manuals there are several example programs. This spreadsheet contains all of the example code for you to work through as a learning exercise and a starting point for your pump programs. When you have installed SyringePumpPro you can launch the PPL Creator using the start menu entry. PPL creation requires time spent with the pump manuals to understand the commands the pumps take. The PPL spreadsheet is handy because it creates your PPL file for you, by you clicking and selecting the commands you want. This means no errors when you upload the PPL file. Less frustration and lots of time saved. See the User Guide for SyringePumpPro for more details. Help -> User Guide.